The ganesh idol is placed in a '\n' ‘makhar’ made of thermocol pieces assembled together with with layers of thermocol cut outs. - the patterns are mostly floral and abstract eg. looks like a kalash. - its painted using a spray gun and acrylic paint. - material - thermocol, acrylic paint, coloured stones. The ganesh idol is placed in a ‘makhar’ made of thermocol pieces assembled together with with layers of thermocol cut outs. - the patterns are mostly floral and abstract eg. looks like a kalash. - its painted using a spray gun and acrylic paint. - material - thermocol, acrylic paint, coloured stones. The ganesh idol is placed in a ‘makhar’ made of thermocol pieces assembled together with with layers of thermocol cut outs. - its painted using a spray gun and acrylic paint. - material - thermocol, acrylic paint, coloured stones. 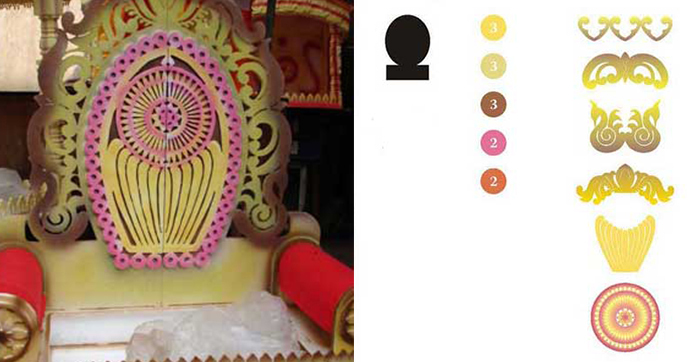 The ganesh idol is placed on a ‘sinhasan’ made of thermocol pieces assembled together with with layers of carved thermocol. - the patterns are symmetrical and mostly floral and abstract eg. abstract form of leaves. - its painted using a spray gun and acrylic paint. - material - thermocol, acrylic paint. The ganesh idol is placed in a ‘makhar’ made of thermocol pieces assembled together with with layers of thermocol cut outs. - almost all the patterns are floral and symmetrical. - its painted using a spray gun and acrylic paint. - material - thermocol, acrylic paint, lace. The ganesh idol is placed in a ‘makhar’ made of thermocol pieces assembled together with with layers of thermocol cut outs. - almost all the patterns are floral and symmetrical. - its painted using a spray gun and acrylic paint. - material - thermocol, metallic colours, lace. 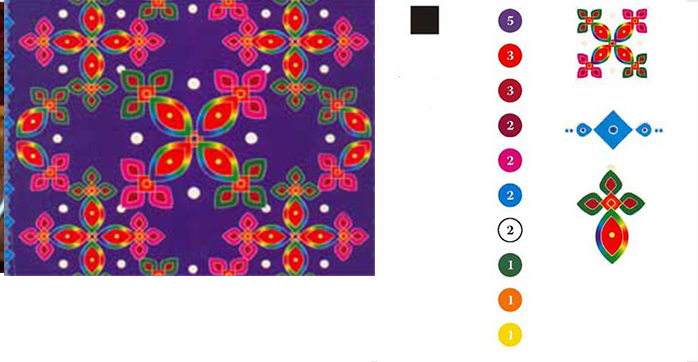 Use of computer generated graphics and techniques (gradient fill) which cannot be produced by hand - intricate/floral/decorative patterns (psychedelic) - symmetrical design - material - plastic coated sticker. 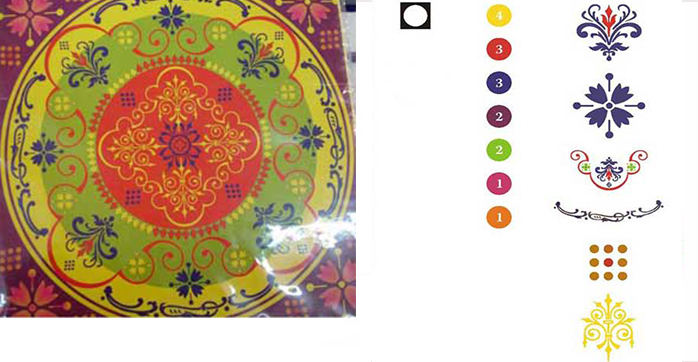 Use of computer generated graphics and techniques (gradient fill) which cannot be produced by hand - intricate/floral/decorative patterns - symmetrical design - material - plastic coated sticker. 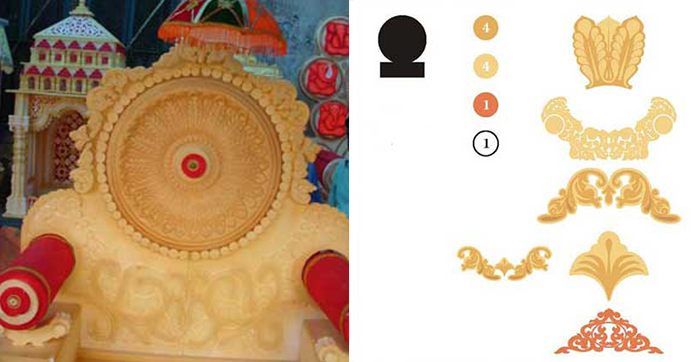 Main graphic element is the ‘kalash’. 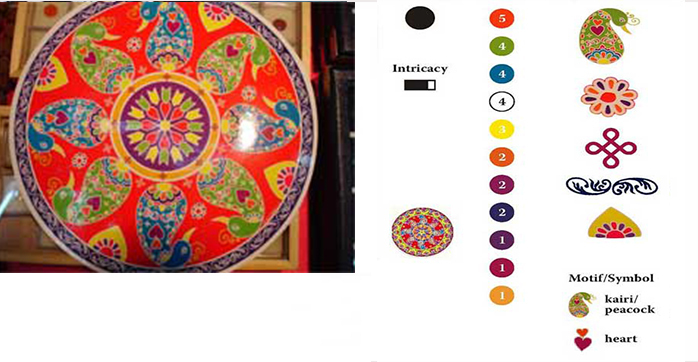 Its very different from a traditional rangoli design - even the use of colour is very unusual eg. The colours used for the kalash. - use of computer generated graphics and techniques (gradient fill) which cannot be produced by hand - default fonts have been used for certain decorative elements, eg. Windings, WP Iconic Symbols - material - plastic coated sticker. Main graphic element is the kairi which is converted into a peacock. Its very similar to a mehendi design. - use of computer generated graphics and techniques which cannot be produced by hand - default fonts have been used for certain decorative elements, eg. Windings 2 (a), Windings (z) - material - plastic coated sticker. 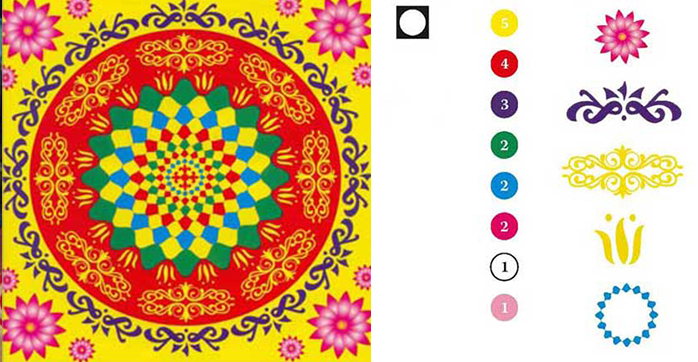 Use of computer generated graphics and techniques (gradient fill) which cannot be produced by hand - indication of black dots which are used in making traditional rangoli, made with powder. this is probably done to make it look more organic - symmetrical design - material - plastic coated sticker. 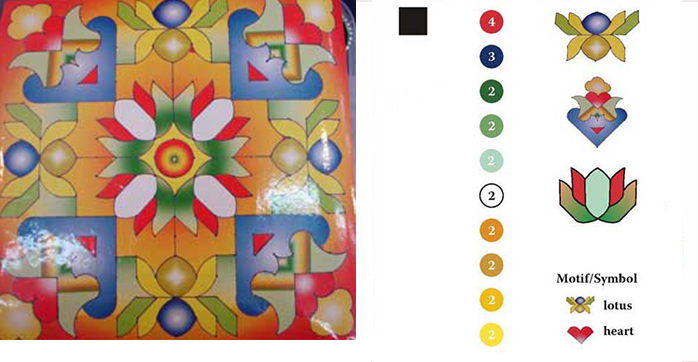 Use of computer generated graphics and techniques (gradient fill) which cannot be produced by hand - intricate/floral/decorative patterns - very similar to ‘bandhni’ prints from Gujarat - symmetrical design - material - plastic coated sticker. In India, design has always been a part of everyday life. 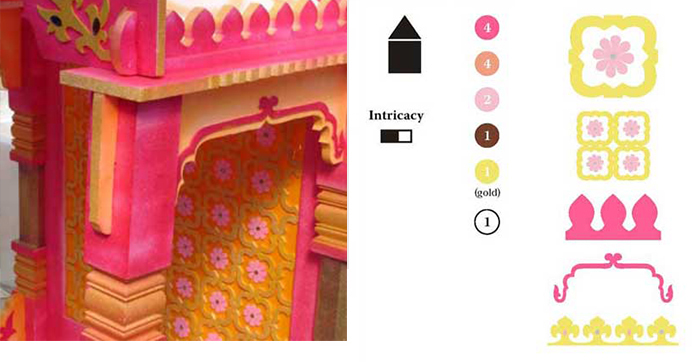 Indian Festive Decoration is very diverse and rich in terms of its graphical elements and patterns. 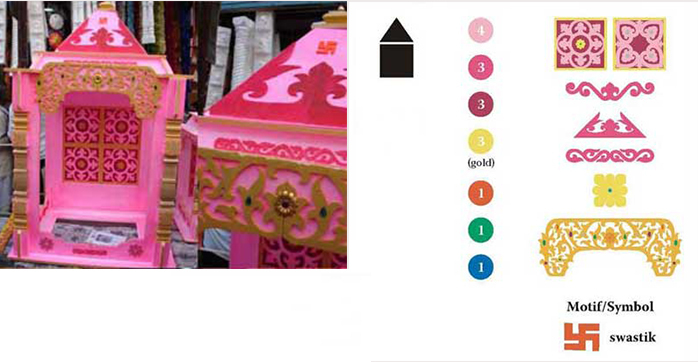 Here is an attempt to document decorations that are readily available in the market, with varied forms and patterns. The main area where almost all kinds of decoration material is available in Mumbai is around Dadar station. Before every festival the area has lanes filled with decorations, which come from different parts of the country. The festivals covered were - Ganesh Chathurthi, Navratri, Durga Pooja, Dassera and Diwali. 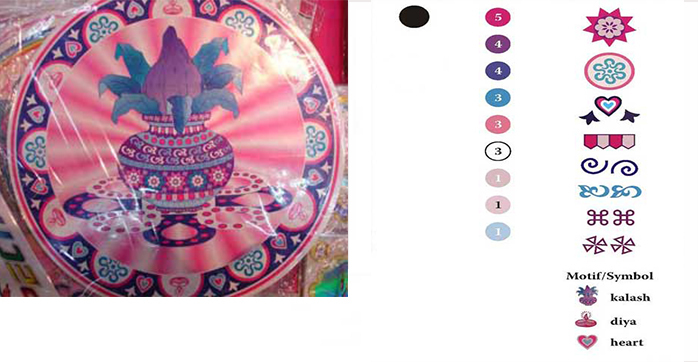 The documentation consisted of lamps, lanterns, torans, pots, rangoli stickers, garlands. 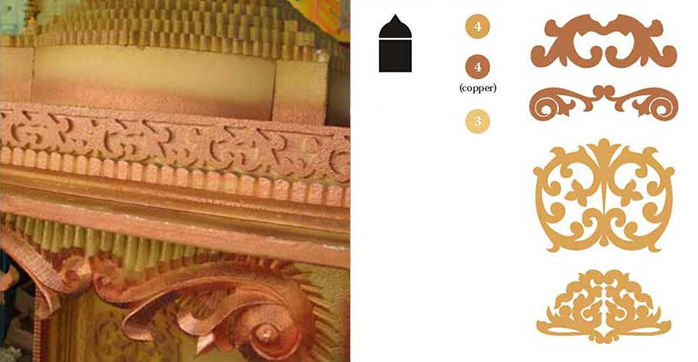 These were then visually analysed on the basis of shape, colour, level of intricacy, repeated patterns and motifs. 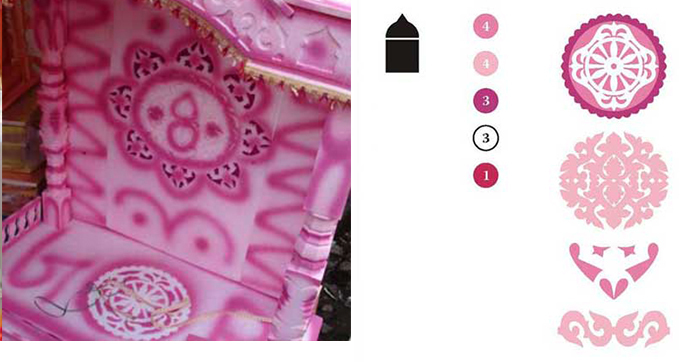 The major recurring decorative elements were graphically reduced to basic elements. These were further used for creating patterns of various kinds.